Hailing from the almost mythical season that witnessed Bill Barilko plot the overtime winner in Game 5 of the 1951 Stanley Cup finals to clinch Toronto’s ninth championship, we have a Maple Leaf Gardens 10K gold lifetime pass that was presented to Leafs legend Tod Sloan. At 1” in diameter and with a weight of approx. 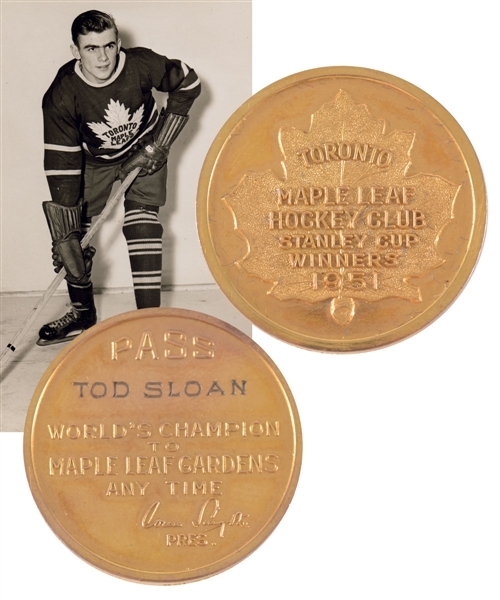 15 grams, a raised and detailed maple leaf sits over the obverse along with “Toronto Maple Leaf Hockey Club Stanley Cup Winners 1951”, while the reverse feature’s “Pass” above in larger letters, along with “Tod Sloan” and “World’s Champion – To Maple Leaf Gardens Any Time”. A facsimile Conn Smythe signature sits beneath the text along with “Pres.”, with “Birks” and “10K” stamped along the edge. With just light handling wear, the seldom-seen pass remains in gorgeous condition, with an LOA from the Sloan family to accompany. Sloan played in each of Toronto’s 70 games during the 1950-51 NHL season, scoring an impressive 56 points which would include 31 goals and 25 assists. Auction closed on Wednesday, November 7, 2018.